Every fraternity should have a parent’s weekend during the fall. The event should coincide with a football game. The event has the potential to be a great time, but the fraternity needs to watch out for a few issues. First, the fraternity needs to make sure the house is very clean. While most brothers understand how disgusting a fraternity house can get, their mothers won’t. If the house is too bad, it could prevent some parents from allowing their son to live in the house. Second, be sure to take care of the logistics. Make sure enough tickets are purchased and there is enough parking for everyone. Be sure all the brothers are very clear on the plan. Third, make sure all brothers are on their best behavior. There should be no swearing or off-color conversation. Drinking should also be kept to a minimum. Finally, be sure that the fraternity president addresses the crowd sometime during the event. He should thank the parents for all they do for the brothers in the chapter, and thank them for attending the event. 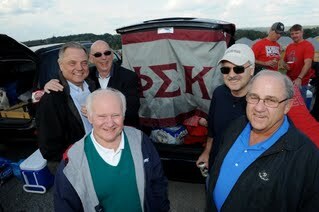 Also, the president should make sure to thank the brothers who did the work to make sure the event was a success.